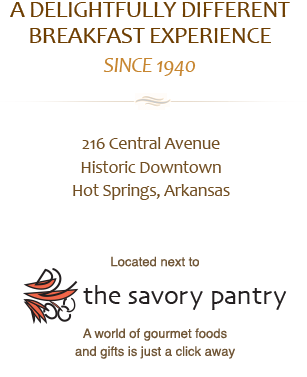 Uppity and Downhome: Savory Pantry and The Pancake Shop. Best breakfast spot to overhear betting tips. I grew up in a place like this. The Pancake Shop is like a diner in Grandma’s kitchen. From flapjacks to salsa, Hot Springs diners shine. This is a city where a lot of breakfasts are eaten.